There's a wealth of functionality on offer from the latest AC routers, but manufacturers are doing a good job of ensuring that installation and setup is as a simple as could be. 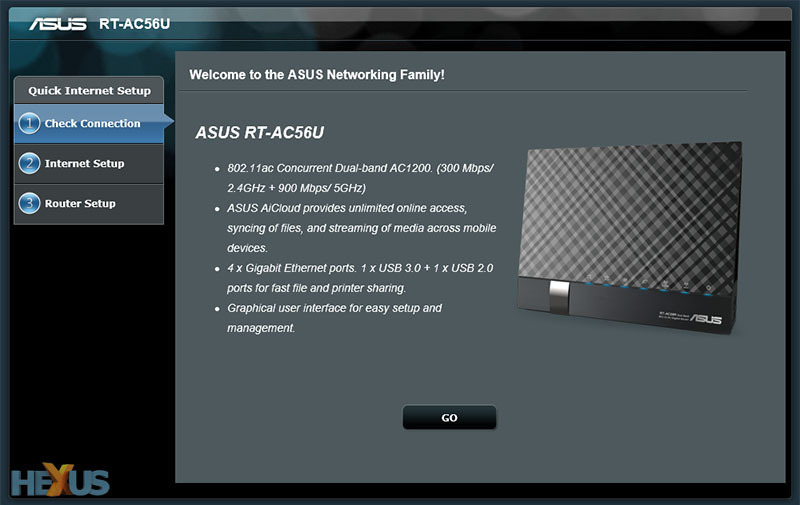 Maintaining continuity throughout its range, Asus's latest routers all offer a familiar graphical user interface that's easy to get to grips with. 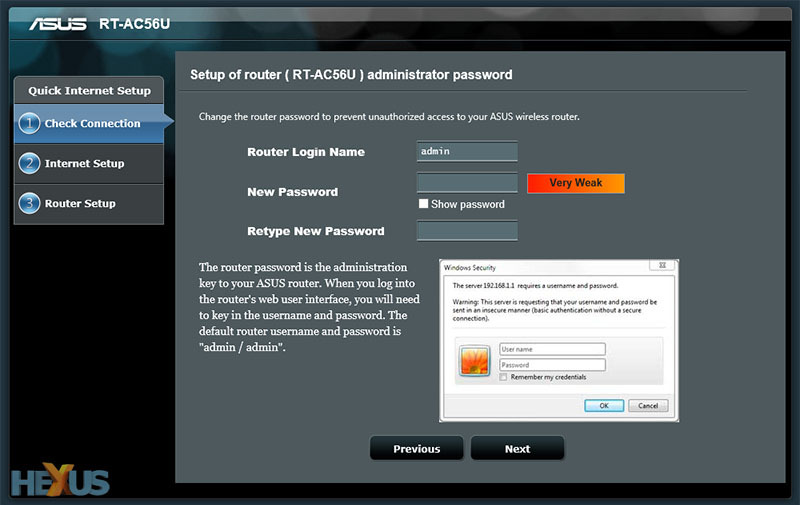 The setup process for both routers on the test bench is practically identical, so while the following screenshots depict the setup wizard for the RT-AC56U, the same applies to the RT-AC68U. 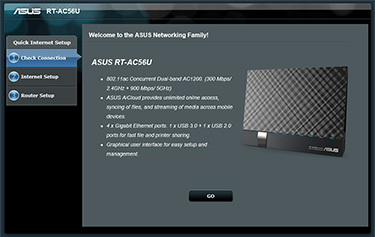 After plugging in the router and attaching your network, opening a web browser automatically redirects you to Asus's Quick Internet Setup wizard. Should it fail to do so, you can access the page by pointing your browser to the default network address of 192.168.1.1. From here, it's just a couple of steps until you're fully up and running. To get started, the setup wizard asks you to choose a username and password that's required whenever you return to the web-based admin panel. Once entered, the wizard moves on and automatically detects your Internet connection - it had no trouble communicating with and configuring access from our BT Home Hub. With an Internet connection established, the final step is to configure the dual-band 2.4GHz and 5GHz wireless radios. 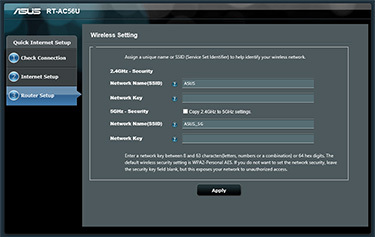 The network names are predefined as ASUS and ASUS_5G, respectively, but both are easily changed and users can enter their own network keys. 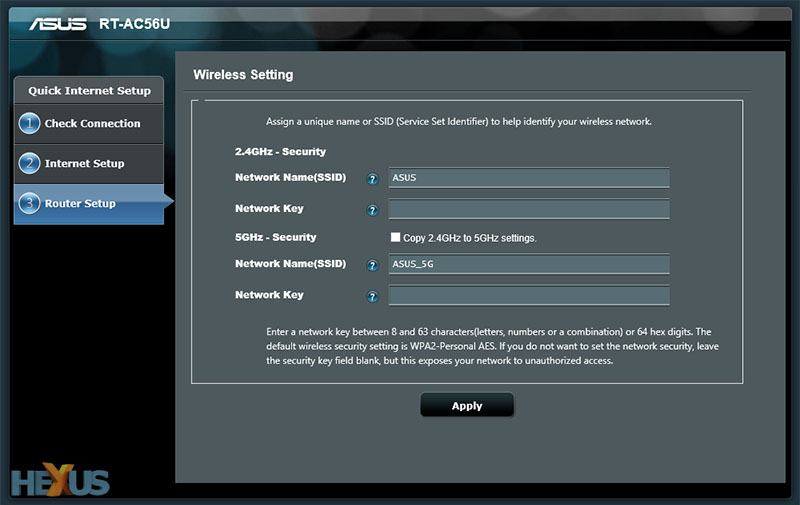 Wireless security is configured as WPA2 by default, but it's a shame Asus doesn't provide a preconfigured security key to prevent the possibility of unsecured networks. We'd prefer to see a predefined key included in the box. But that, really, is all that's required to get up and running. Once the setup wizard is complete, users are redirected to the web-based admin panel, where detailed configuration options are available if needed. 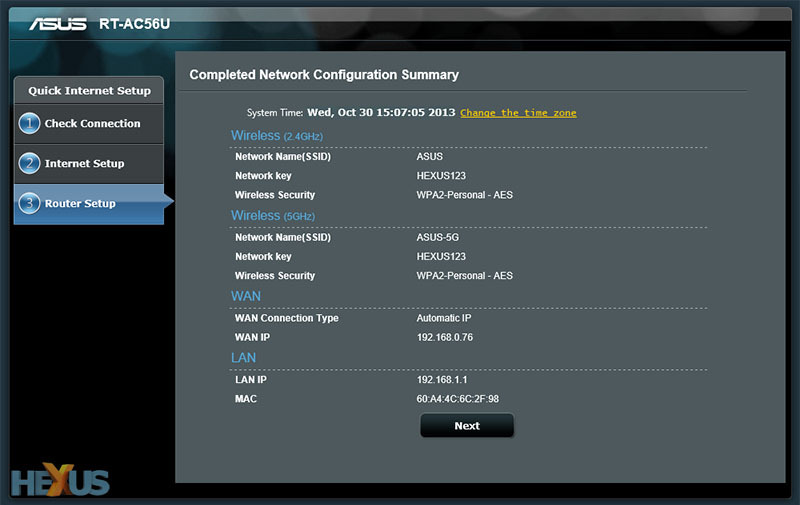 The presentation of Asus's admin panels has barely changed in recent months, but that's no bad thing. 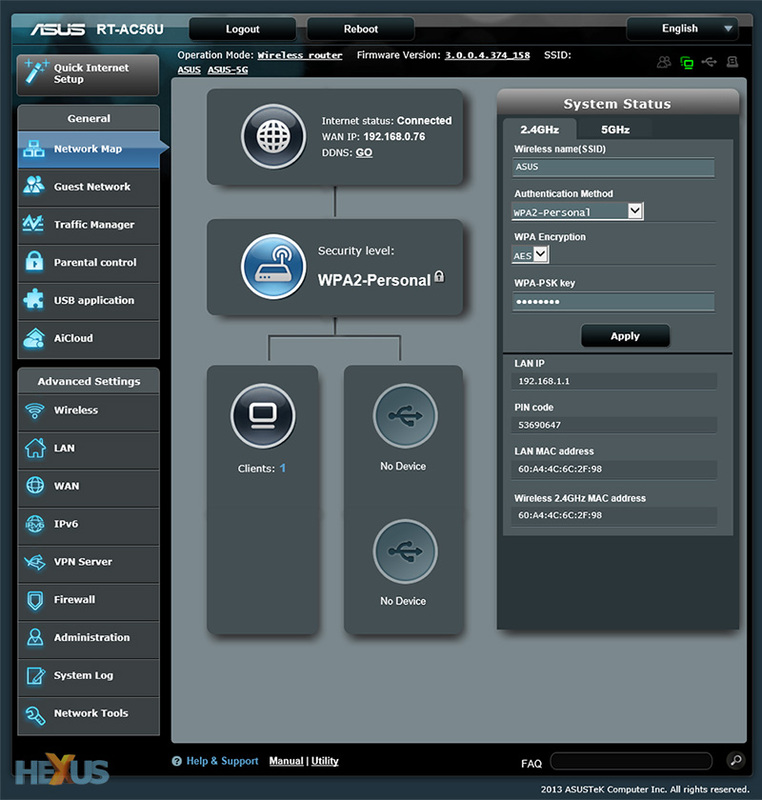 The interface is well laid out and easy to navigate, with the homepage providing basic status information as well as the ability to quickly alter WiFi settings. A left-hand menu, meanwhile, provides access to some of the more advanced features. These include support for multiple guest networks on either the 2.4GHz or 5GHz bands, a traffic manager that can be used to prioritise certain applications, and parental control that allows you to limit web access to specific clients using a time schedule. Elsewhere, you'll find a built-in print server, a dedicated download manager, and various applications that help you make the most of storage attached to the USB ports. 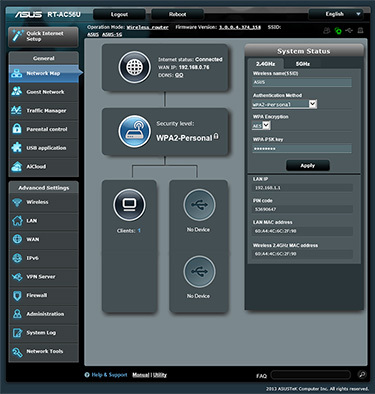 Asus includes DLNA/iTunes media servers for multimedia sharing, there's a built-in FTP client, and through the use of dedicated AiCloud apps, it's possible to access your router-connected storage device remotely from an iOS or Android device. 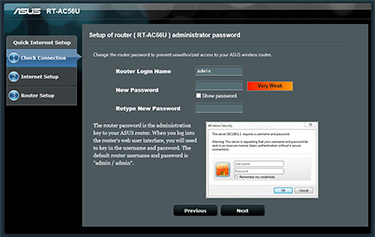 The addition of USB 3.0 should allow the RT-AC56U and RT-AC68U to serve as a capable home-user-orientated NAS, and the simple configuration options are such that users of all levels should have little difficulty in making full use of the available feature set. With a dual-core processor and 256MB of RAM under the hood, we found the interface snappy to navigate at all times, and noted that reboots or configuration changes were applied with reasonable speed. 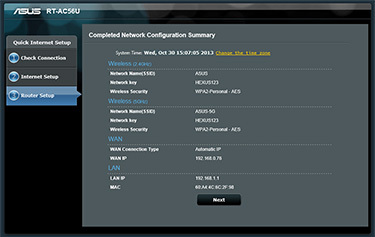 But don't just take our word for it, if you want to try the interface for yourself, check out Asus's online demo at this URL.